Llwyngwril Gallery Holiday Accommodation01341 250884work Self-cateringLlwyngwril Gallery has recently been converted to create two spacious and luxurious units that are full of character. The Gallery theme is retained in the properties promoting works of art by local artists,and information about the Arts and Crafts available in the area, exhibitions and Artists Contact details. The property has been divided down the middle, giving each unit an upstairs and downstairs and both units are individual. 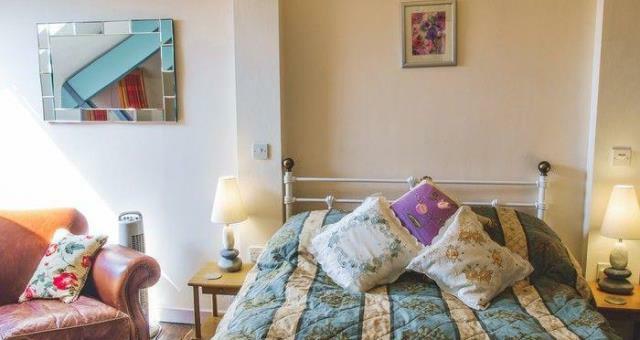 Myfanwy is accessible for Wheelchairs, and has a wet room, as the en-suite to the downstairs bedroom. 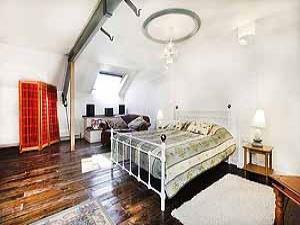 The upstairs bedroom in Myfanwy is very large and has a luxury bathroom, with whirlpool bath and shower. Day bed with a trundle bed beneath. The living space is all downstairs with a log burner stove and there is ample room for guests to find their own spot for a bit of solitude. The kitchen is spacious and well equipped with all conveniences that guests would have at home. (Dishwasher, washing machine, microwave, fridge-freezer) The garden is enclosed, which makes it safe for young children. Picnic bench and Parasol. Mihangel is the unit entered via the main arched doors. The bedrooms are downstairs and each has a luxury shower room, en-suite. There is a bike store, so that expensive bikes can be stored safely inside. The living space is upstairs and is open plan, with kitchen and breakfast bar, Dining table, to seat 6-8, and ample space to sit and relax, with satellite tv, music, DVD etc. Also picnic bench and parasol outside in separate area from Myfanwy. Exceptional amount of space in both properties. There is ample room to add zed beds or futon if larger number in party. So could accommodate up to 8 plus a cot in Myfanwy, and uo to 7 plus a cot for Mihangel. The property is heated with Bio-mass boiler, and underfloor heating beneath a polished sandstone slabbed floor on the ground floor, and radiators on the upper floor. Lighting is LED, or at the very least 'eco' bulbs. Care has been taken to be as 'Green' as possible in the conversion. Llwyngwril Gallery has recently been converted to create two spacious and luxurious units that are full of character. The Gallery theme is retained in the properties promoting works of art by local artists,and information about the Arts and Crafts available in the area, exhibitions and Artists Contact details. Llwyngwril Gallery was originally a Church of England School, built in 1831. It became the Church Rooms later on, which accommodated Sunday School, Home Guard Practice, Brownie Camps, Concerts, Wedding receptions (for a number of people living in the village), and all kinds of events in the Community. MIHANGEL Via a ramp, & arched doors. One step into hall, then all level, includes: bedrooms & en-suite bathrooms. Through fire door upstairs, are two short, straight flights, with landing half way. Open plan space: kitchen, dining &relaxing. MYFANWY From left side of car park, access path - gate at the right of building, leads to door. From kitchen, to accessible room, wet-room, grab rails & shower seat. Upstairs a straight flight with turns at bottom and top, the main bedroom with bathroom.